A few Sunday afternoons ago, before the rain and the COLD wind, we had a beautiful Indian Summer afternoon. Warm, and a bit balmy. A good day (since all the leaves were still on the trees) to plant some spring bulbs I had bought. A day that made me happy. Maybe the sweetest part was knowing that days working outside are so limited. Not that I want them to end, but knowing that the gardening season is just about over makes being in the garden so much the better. It intensifies the enjoyment because you know it is going to be way too many months before gardening days come again. I made this page in my journal about that afternoon. The colorful background represents the colorful trees in the woods behind my garden. I drew and colored the bulbs on paper, and then cut them out and added them to my page. I am linking up to Art Journal Journey. The talented Valerie has been our hostess this month with this wonderful Indian Summer/Golden October theme. And speaking of Indian Summer, I am enjoying season 2 of Indian Summers on PBS. Have you seen it? Its a classic British drama set pre-World War 2 India. I really enjoyed season 1 and am enjoying season 2. Its still chilly here in my world. Hope its a warm Indian summer day in your world. your pages is lovely - adorable bulbs - you drew and painted them so super! Happy day Erika! Thank you for joining AJJ with another great entry! You rock! Not heard about that film/series - will check it out! oh I am enjoying that series, its really good, the bomb exploding the other night,, oh,, I thought they were all goners!! Indian summer, great season and great tv show lol,,Beautiful journal page too!!! Nice and colorful page. A good idea to plant bulbs now for having nice flowers next springtime. Its a wonderful page, love the colours. The bulbs will be good to see when they flower next Spring. That is gorgeous! I love all the bright and joyful colors you used. Blessings! It rained in my world yesterday, and of course I had to be out and about buying more groceries. Today is supposed to be unseasonably warm, as is the rest of the week. Of course, I would have to be stuck inside doing dreaded deep cleaning in anticipation of weekend friends. I wish I had purchased some bulbs when I was at the hardware store the other day. They had them out and I was almost tempted. I love that you bought some and journaled about it. It's a super page, and I simply adore it. Have a wonderful Thursday. You've said it exactly how it feels to be gardening now. Good to do, but also very good to know the garden can be put to bed for several months. Is it time to plant Spring bulbs already? - thanks for the reminder, Erika. 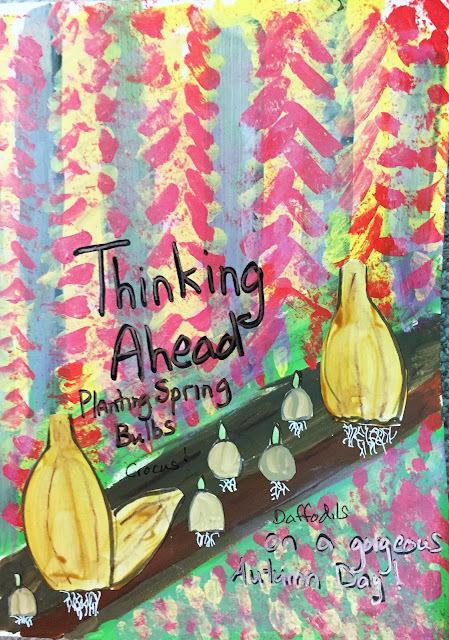 I love your painting of the Spring Bulbs waiting, the big ones and the sweet little ones. I understand what you mean about being outside and in the garden. Or walking or anything. Those days are so limited! I, too, have new bulbs in the ground and hope they survive the winter, which is forecasted to be very hard and cold. I missed the start of Season 2 of Indian Summers and now am too far behind. I'll need to go back and catch up from the beginning. Have you seen "The Durrells in Corfu" (8 p.m. on most PBS stations Sundays)? I'm loving that one! I tried planting alium a couple of years ago and something chewed them off as they sprouted. Very discouraging :( I hope your flourish!